A long weekend on the 2' gauge railways of Wales, ostensibly to ride Saturday's Snowdonian, over the Ffestiniog and Welsh Highland Railway in both directions, some 80 miles. Add to which we rode the Vale of Rheidol on Friday 12th and paid a visit to the Brecon Mountain Railway and it's extraordinary Baldwin pacific on Sunday 14th. Compared to last year the weather was pretty poor unfortunately, but the whole weekend was still great fun. Friday dawned wet so we decided to ride the Vale of Rheidol to Devil's Bridge. The VoR is a 12 mile line, opened in 1902 and, rather uniquely, was operated by BR from nationalisation up to 1989. Today it is owned and run by a charitable trust. 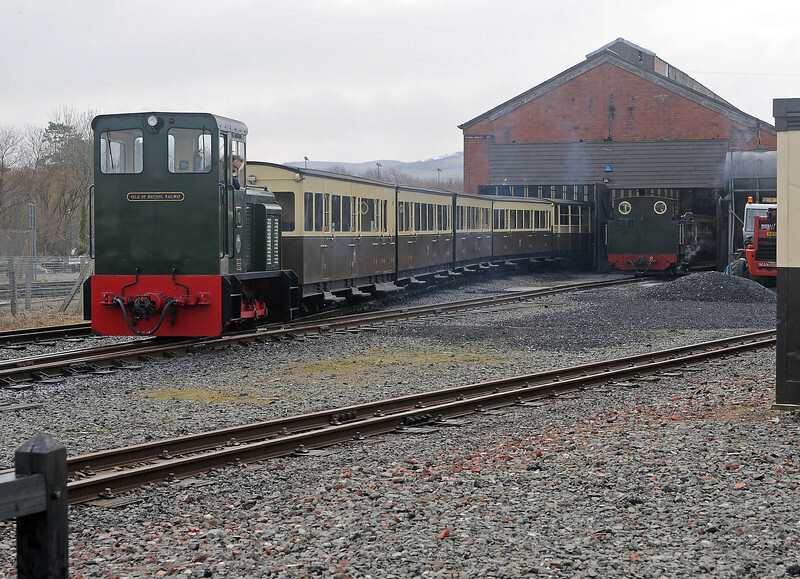 The coaches for the 10:30 departure are drawn from the running shed behind no.10, bought from the Brecon Mountain Railway when ownership of the two lines was linked.